He cautioned that some countries may still require unabridged birth certificates, and that only the parent and/or guardian who registered the child in question will have their details printed in the child’s passport. The other parent or guardian can apply to have their details included. Additionally, written parental consent is still required for children travelling abroad without either parent. Further, the second phase of the system upgrade will comprise the automation of birth registrations for children aged a year or older, as well as the automation of new marriage and death registrations. This phase will start in the new financial year. 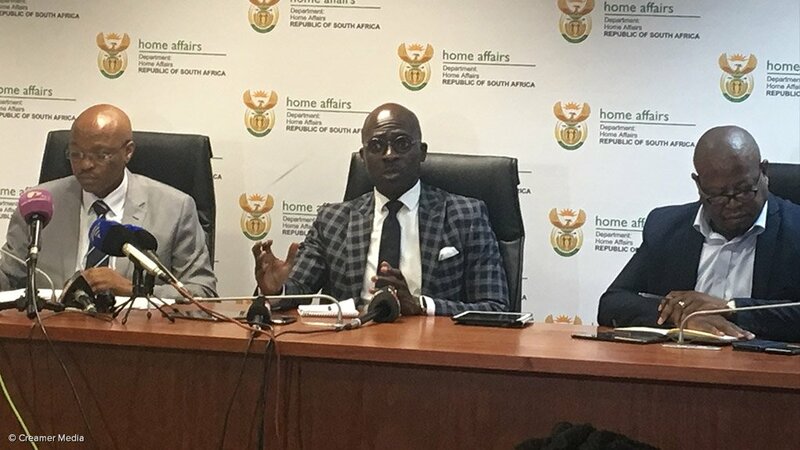 Gigaba stated that the new system will eliminate opportunities for corruption and fraud within the department, as well as fraud involving people outside of the department, by limiting opportunities for human intervention. He assured members of the media that the automated BMD system will be secure. DHA director-general Mkuseli Apleni noted that the department’s systems have never been hacked. Apleni further assured the public that the digitised system would not exclude citizens who lack Internet access or computer literacy. He also noted that the department is planning to finalise the automation process within a year, but that the roll-out may take more time. He noted that Home Affairs as a whole was understaffed by about 8 000 people and that the automation and digitisation of certain aspects of its processes resolved issues pertaining to a lack of capacity. He noted that the department would seek to retrain much of its staff and ensure that new recruits possess the skills needed by the organisation in future. Gigaba also mentioned that the DHA had recently met with Business Leadership South Africa, where the organisation committed to providing interns to the department to assist in bridging the skills gap, as part of the Youth Employment Service initiative. Meanwhile, the DHA warned that the national system upgrade, which will start at 14:00 on July 13, will impact on its 184 modernised offices – those capable of processing smart ID applications – until July 20. These offices will be unable to receive ID and passport applications, but will still attend to applications already in process. Additionally, all other services offered by Home Affairs offices will still be available.